Last night Joshua and I attended a lecture by the Rev. 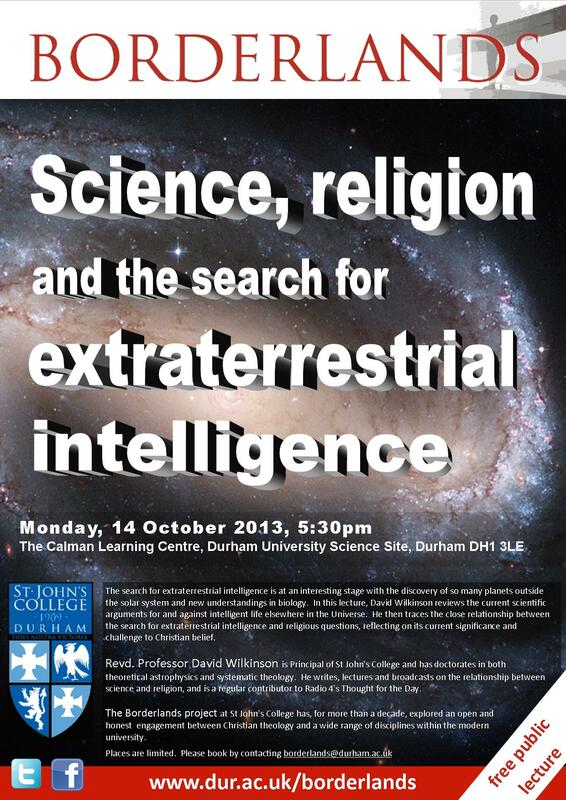 Prof. David Wilkinson entitled “Science, Religion, and the Search for Extraterrestrial Life.” He holds a PhD in theoretical astrophysics, a PhD in systematic theology, and he is a Methodist Minister. He is one who is well equipped to engaged the questions posed by some today: “What will Christianity do if or when we do make contact with alien life forms?” Some have said that it will be the end of faith as we know it. Some Christians have welcomed it as proof of an omnipotent God. Additionally, there are a million questions in between. This is a Borderlands Lecture. The idea behind the Borderlands lecture is to embrace the areas where the church and the world may have traditionally made borders–you stay on your side and I’ll stay on mine. This engages those areas as places of valuable discussion. It readily admits that we may not have all the answers, but let’s have the important discussion. David touched on the history of the search for extraterrestrial intelligence (SETI) and some of its arguments over approximately 1400 years. He discussed Hubble, Drake, and Fermi’s paradox, among others. If this sort of discussion interests you, I’d commend his book to you. You can find it on Amazon, among other places: http://www.amazon.com/dp/0199680205/ref=rdr_ext_tmb David is one of the supervisors for my research project–and, no, I do not receive any remuneration for this recommendation. I bet it was very interesting. Leaves me to wonder what the makeup was of the attendees. Primarily Cristian, Atheists, etc. ?